Here you will find many types of rotation meter. There are different ways of measuring revolutions within the industrial sector, either optically or mechanically. The PCE-151 handheld series of rotation meter with RS-232 interface can measure revolutions and velocity and store the readings onto a computer using software which comes with the device. The handheld digital rotation meter is ideal for measuring velocity and revolutions in research and maintenance. The PCE-T236 rotation meter measures velocity both by contact and non-contact and is good value for money. Non-contact measurement of velocity is done with the help of reflective tape. For a device that can be installed for measurements over a period of time, we recommend the PAX I rotation meter. The revolver PCE-DT 50 in the form of a pistol is ideal for quick control of speeds. This PCE-DT 50 tachometer measures the rotational speed of moving objects, such as shafts, drives, pinions etc., without contact. PCE-DT 66 is a portable, digital, handheld tachometer, or rotation meter, that can take measurements of rotational speed. This handheld tachometer features mechanical attachments and is ideal for measuring rotational speeds of machines, motors, conveyor belts and other moving parts. PCE-DT 65 is a digital tachometer, or rotation meter, that can take both contact and non-contact measurements of rotation speed and linear speed. This handheld tachometer features an integrated laser and includes a mechanical attachment with contact probes, making it the ideal measuring instrument for machines, motors, conveyor belts and other moving parts. The tachometer can be used contactless or with mechanical contact. The PCE-T237 digital tachometer is particularly suitable for recording rotational speeds and speeds on rotating machines and systems (on conveyor belts, motors, belt drives, etc.). The tachometer PCE-T 238 is a battery-powered hand-held device that allows mobile use. 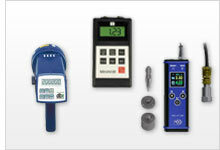 The handheld tachometer can perform a contact measurement as well as a non-contact measurement. It is also possible to perform a measurement of the surface velocity. The handheld tachometer allows a measurement of up to 99,999 revolutions per minute. This measuring range is possible with contactless measurements with the optical tachometer. PCE-151 is a portable digital handheld optical tachometer or laser rotation meter for non-contact measurements of rotational speed in rpm or rps (Hz). An optional mechanical adapter for contact measurements of rotational speed in rpm /, m / min, ft / min and yard / min is available as an accessory. PCE-151 features an RS-232 interface, analytical software and a built-in event counter with a range of 0 ... 99999 and a max. input frequency of 10 KHz with 5% duty cycle. The PCE-LES 100 Tachometer combines LED technology with compact and accurate electronics, which controls the sequence and timing of flash over the entire measuring range. Thanks to LED technology, the Tachometer does not need periodic changing of bulbs. The tachometer is sent to you calibrated (by the manufacturer PCE Instruments). PCE-VT 204 is a multifunction handheld tachometer with the ability to accurately measure both rotation and vibration. An ideal tool for the testing and inspection of machine parts and components such as motors, transmissions, gears, gear boxes and wheels, this multi-purpose device measures revolutions per minute (RPMs) as well as three-axis vibration, i.e., speed or velocity, displacement and acceleration. The Tachometer Nova Strobe dbl Kit is used for speed and vibration measurements or observations of movement. Stationary strobe tachometer with intelligent LED-technology.